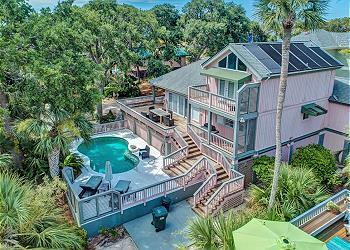 Lovely 2nd-row ocean North Forest Beach home with a private *heated pool and hot tub. This 4 bedroom, 4 bath home has an open floor plan with 2 living areas. Upon entering the house, the main living area is to your right and leads to the expansive deck. There is a gas grill on the deck for the grill master in the family along with tables and chairs for dining! Plenty of outside lounge chairs around the private pool allow the whole family to relax poolside. The living room also opens into the dining area and kitchen. The dining room has seating for 8. The kitchen with all new stainless-steel appliances has a breakfast bar with seating for 4. Off the kitchen is a pretty Carolina Room that is bright and has a large flat screen television. The master suite, located on the same level, is outfitted with a king bed and a large updated private bath. The 2nd bedroom on this level has 2 twins and an updated bathroom. Upstairs has the 2nd king master suite and a private updated bathroom. Enjoy ocean views from your private sun deck. The other bedroom on this floor also has a private sun deck with beautiful views. This bedroom has 2 queen beds, a private updated bathroom, and a living area with queen sleeper sofa. Each bedroom is equipped with a flat screen television. In the garage, you'll find a ping pong table to hold friendly tournaments. 7 Quail is perfect for entertaining the whole family. •	*Private Heated Pool (16 x 20 x 12) *This pool can be heated at an additional charge and has an electric pool heater. The cost per week is $300 + Tax to heat Pool. We loved this home for our extended family vacay! Vacation Company provided everything we needed and when we did have a few issues they addressed them PRONTO! The decor and furnishings in this home are beautiful. We especially enjoyed all the recliners in the evening after the kids went to bed. We will back to HHI and 7 Quail!